- Some bargain mountain bikes for sale! Damian devised a devious teams race - teams of three with each team having to complete 10 laps. Handicapping, such as it was, meant each team has a rider to ride two laps, a rider for 3 laps and a rider for another five. All except Damian’s team who had to do a total of 11… which didn’t work out so well. The track work has been done, now it's time to install the signage! Parks Victoria have produced a series of trail signage to be put in at Riflebutts Reserve but first... we need to install the posts for them to be mounted onto. This Sunday from 1pm to 4pm. Please bring along a shovel, post hole diggers, crowbars. Le President saves our pride! MMBCC raced 25km on Howes Creek Rd with 36 starters it was a night where the kids were showing the parents how its done, the respect to the elders was only restored by a solo breakaway Le President Craig Wilson who took the win. It was a night for the front markers and the youth of the club with young Ben Grundy coming in 2nd, Talia Appleton 3rd, Elise Empey 4th and Bella MacMunn 5th. The limit markers of Deb Salatenna, Ben Grundy and Bella MacMunn starting proceedings, followed 5 minutes later by Tony Morris who was joined by Elise Empey, Talia Appleton and Bella Green after being solo until 20km to go. However in the next group Di Condie and Craig Wilson were setting a great starting pace and newcomer Judi Duke was already unhitched from the group before the 5.5km mark. It was a tough night racing for many that were dropped early. Chris Taylor had a night of two halves after being dropped within 5km from his bunch managed to hang the back of the following bunches for the next 15km until 20.8km and then once the rolling climbs came towards the finish he was done! The eyes were on the Scratch markers of Dan Purcell and Kian Lerch-MacKinnon though, as within the first 5.5km they had already pulled the 90sec head start to the block group containing Bruce Halket, Jock Brega, Rob Curtis and Dave Empey back to less than a minute. It took the Scratch boys until 18.7km until the catch was made. Probably because the block group caught the group in front of them at 9.5km and there was at least 9 men driving the pace. Unfortunately for the chasers the front markers had the experience of Di Condie and Craig Wilson setting the pace. Di normally very successful on this course suffered a puncture with about 3km to the finish. With Di out of the picture Le President (Craig Wilson) rode away solo taking the win by almost a minute ahead of the junior racers. The bragging rights belonged to the kids with Ben (2nd) beating big brother Will and Dad Damian, Talia (3rd) beating Mum Janine and Dad Jarrod, Elise (4th) beating big brother Matt and Dad Dave, and Bella (5th) beating Dad Tom. Here are the very details results… thanks Jodie! Many thanks to our dedicated volunteers and officials for all their hard work; and to the drivers of Howes Creek Road for being so patient. 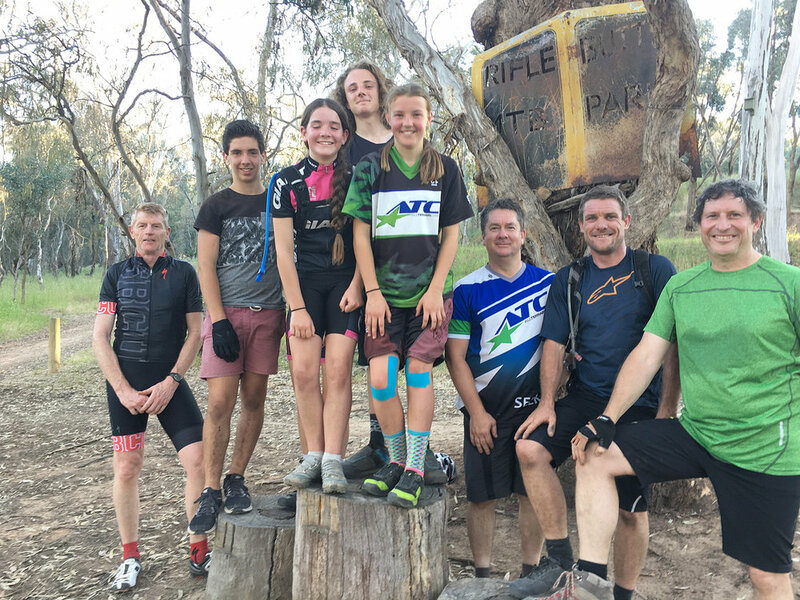 Next week sees the club take on the longest Thursday night race of the summer, the full 32km catastrophe from the Botanic Park around to Graves Road via Sawpit Gully Road. Entries by 8pm Wednesday: no pre-entry – no race! Have you got a budding mountain biker who needs a steed? All Terrain Cycles are selling these Specialized Hardrock mountain bikes for just $250. Yes, you read that right… $250! They’re alloy-framed hardtails with 26” wheels, hydraulic brakes and are in pretty good nick. XS up to XL available. Call ATC on 5775 2724. They won't last!